– E-health – new technology and health communication. Manuscripts will be sent anonymously for review by independent referees and so all material identifying the author should be deleted. Manuscripts should be 1.5-spaced throughout (including tables), and each page should be numbered consecutively. Manuscripts should not exceed 5,000 (five thousand) words and should have an Abstract of 150-250 words. The font used should be Times New Roman size of 12, and all margins should be at least 2.5 cm. Authors should preferably prepare their manuscripts in APA Style (see the most recent edition of the Publication Manual of the American Psychological Association – APA). Manuscripts should be submitted preferentially in English in Word format. Each manuscript will be evaluated by the Editorial Board based on its relevance, clarity, originality and suitability for the journal. Footnotes or endnotes, apart from the opening page Author Note and correspondence address, should not be used. Authors are responsible for obtaining permission from copyright holders for reproducing any illustrations, tables, figures or lengthy quotations. Figures and Tables should be included in the body of the manuscript, in a place considered adequate by the author(s). These must be elaborated according to the APA Style norms, with the respective legends and titles. The authors should use Word's Insert Table function when you create tables. Authors should also declare (if it is the case) that all ethical local regulations have been fully accomplished and that the manuscript has not been submitted to another journal. 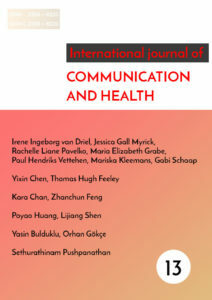 The International Journal of Communication and Health will include reviews of the most recently published books in the field. Author’s last name, Initials. (Publication year). Complete title (edition, if not the first). Publication location: Publishing company. Curtis, S. (2004), Health and Inequality: Geographical Perspectives, London: Sage. Author’s last name, Initials. (Publication date). Title of the chapter. Initials and last name of the Editor (Ed. ),Complete title of the book (first-final page numbers). Publication location: Publishing company. Jones, L. (2000), What is health?. In Katz, J., Peberdy, A., Douglas, J. (eds. ), Promoting Health: Knowledge and Practice, Basingstoke: Palgrave. Author’s last name, Initials (Publication date). Title of article. Title of Periodical, volume, first-final page numbers. Lang, T. (1998). The new globalization, food and health: is public health receiving its due emphasis?. Journal of Epidemiology and Community Health, 52 (9), 538-39. Include a DOI (Digital Object Identifier) if the journal lists one. If no DOI is available, list a URL. Include an access date only if one is required by your publisher or discipline. Author’s last name, Initials (Year of defense). Title of work. Indication of the type of work, Institution, Location. Anderson, G. (2006). Crisis Resolution and Community Mental Health: An Ethnography of Two Teams. Doctoral Dissertation. University of Durham, Durham. Newspaper and magazine articles may be cited in running text instead of in a note, and they are commonly omitted from a bibliography. If you consulted the article online, include a URL; include an access date only if your publisher or discipline requires one. If no author is identified, begin the citation with the article title. A citation to website content can often be limited to a mention in the text or in a note. Because such content is subject to change, include an access date or, if available, a date that the site was last modified. Blog entries or comments may be cited in running text instead of in a note, and they are commonly omitted from a bibliography. The following examples show the more formal versions of the citations. There is no need to add pseud. after an apparently fictitious or informal name. Citations in the text should indicate the author’s last name, followed by the publication year between parentheses. When a citation refers to a work by three, four or five authors, list all the last names the first time a reference to the work appears, and in subsequent references give only the first author’s name followed by “et al.” and the publication year. If a work has six or more authors, give only the first author’s name followed by “et al.” in the first as well as in all subsequent citations. The names of all authors should be mentioned in the references. Each table should appear on a separate page with a brief descriptive title. The tables should be numbered consecutively and placed at the end of the manuscript following references. Placement in text must be indicated by a phrase such as 'Insert Table 1 about here' set off from the rest of the text. Sources for more information in a table should be footnoted below the title. All illustrations and charts should be referred to as Figures in the text. They must be finished drawings not needing further artwork or typesetting, and originals will be required if the manuscript is accepted. Placement must be indicated in text. Details of all funding sources for the work in question should be given in a separate section entitled 'Funding'.